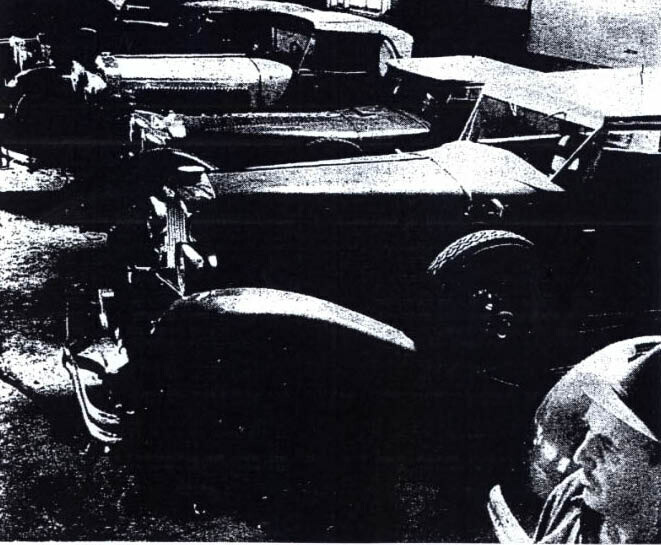 Continuing yesterday's story of the garage on the Farnesworth estate, the property was purchased around 1924 by a Standard Oil heir Wallis Clinton Bird and his wife Marjorie Winifred Kendall. Like the previous owner C.K.G. 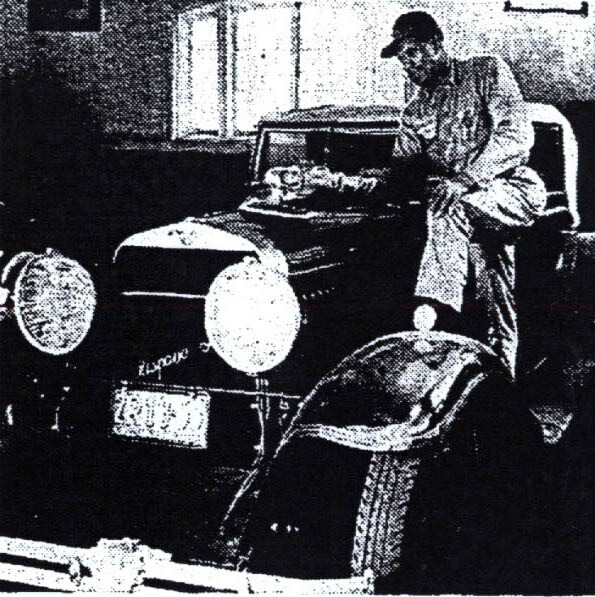 Billings, Wallis kept a spectacular collection of cars in the 20-car garage. Wallis and Winnie Bird lived in the mansion until a June 1940 plane crash in upstate New York took Wallis' life. Winnie ordered the remains of his plane packed in heavy wooden crates and stored in the Farnesworth. 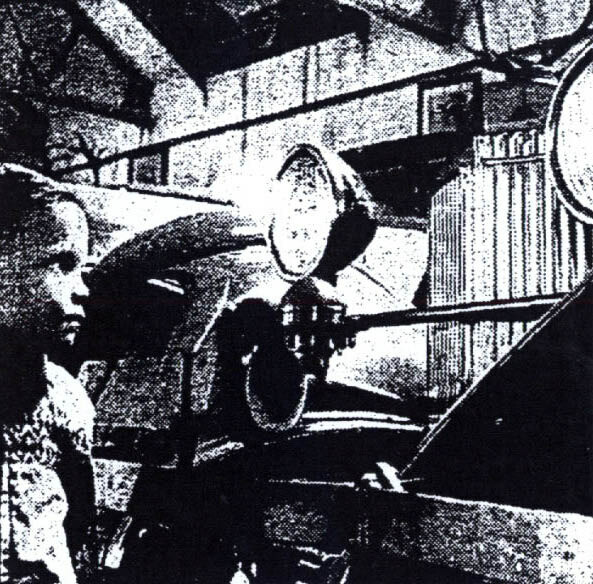 She kept a full staff to watch over the estate and the nine vintage cars in the garage. She later moved to France where in July 1961 she was murdered by her psychiatrist and her boyfriend ..a true and very sad story! Following Mrs. Bird's death, her estate auctioned off the nine vintage cars left in the garage. 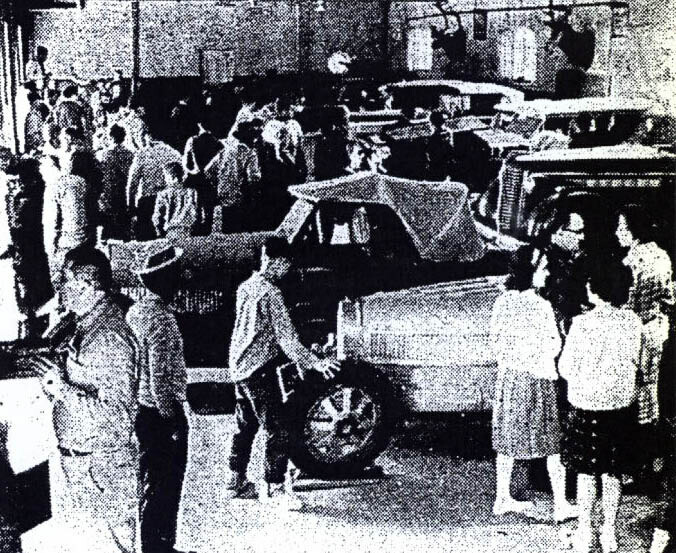 On May 12, 1962, over 3,000 people came to the Farnesworth garage for the "car auction of the century." The nine cars (1926 Hispano-Suiza, 1931 Duesenberg Model J Speedster, 1929 Bugatti Roadster, 1930, Mercedes-Benz, 1930 Duesenberg Sedan,1926 Isotta-Fraschini, 1930 Alfa-Romeo Convertible, 1928 Bugatti Two-Seater and a 1930 Bentley) were sold for a total of $37,850, the equivalent of $298,000 today. A big thank you to Art Kleiner for forwarding articles on the Bird auction. Newsday "Old Cars, On Block at Mansion, Bring 37Gs". Forwarded by Art Kleiner. Coupe was purchased by Harry Gladding of Baltimore for $3,700, equal to $29,500 today. 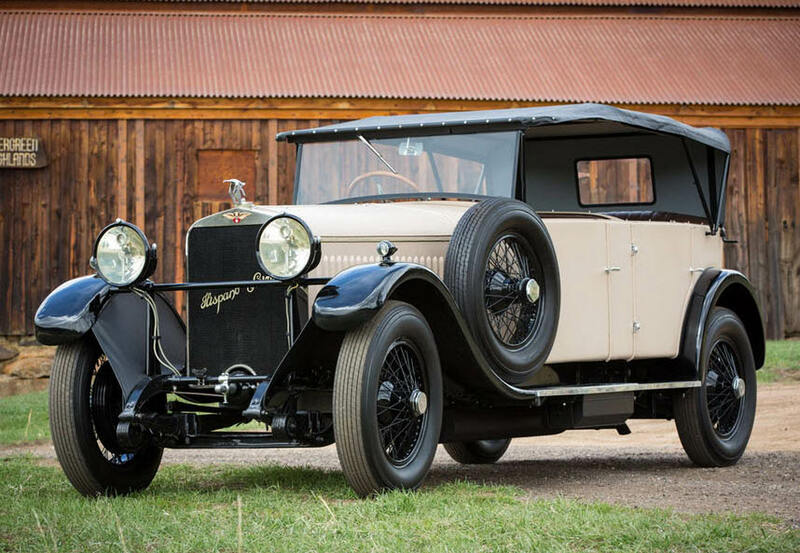 A 1926 Hispano-Suiza H6B Torpedo was sold for $180,000 in 2013. Dieter Holterbesch of Port Jefferson purchased the Duesenberg for $10,000 equal to $78,800 today. A 1931 Duesenberg Model J Figoni boattail speedster. This Bugatti Roadster was purchased by Godron Wattles of Oyster Bay for $1,850 equal to $14,600 today. A 1929 Bugatti Type 40 Roadster is currently available for $585,000. Purchased by Jacques Tunick of Stamford, Connecticut for $5,000, equal to $39,400 today. From front to rear: 1930 Duesenberg Sedan (purchased by Jacques Tunick of Stamford, Connecticut for $5,300, equal to $41,750 today), 1930 Mercedes-Benz, 1926 Isotta-Fraschini (purchased by Jacques Tunick of Stamford, Connecticut for $3,650, equal to $28,750 today) and the1926 Hispano-Suiza. 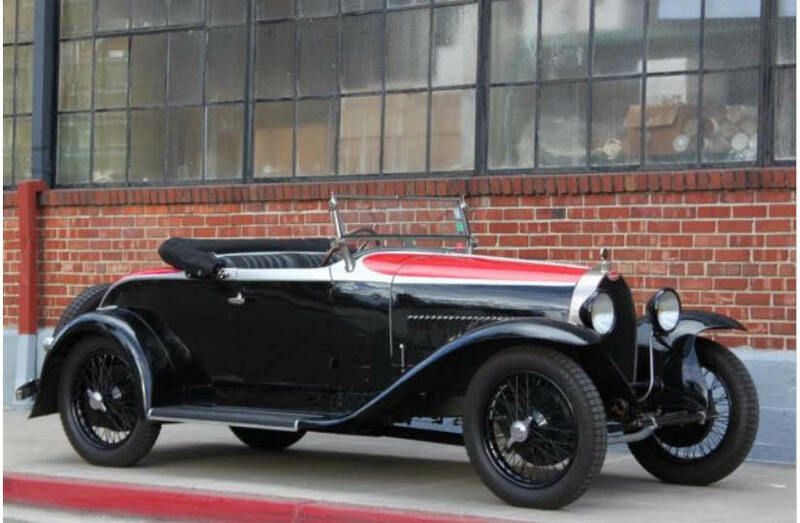 A 1930 Alfa-Romeo Convertible was purchased by Jacques Tunick of Stamford, Connecticut for $3,100, equal to $41,750 today). A 1928 Bugatti Two-Seater was purchased by Henry Austin Clark, Jr. of Southampton for $1,750, equivalent to $13,800 today. A 1930 Bentley with "a sunroof" was purchased by James P. McAllister for $3,500, equal to $27,500 today. 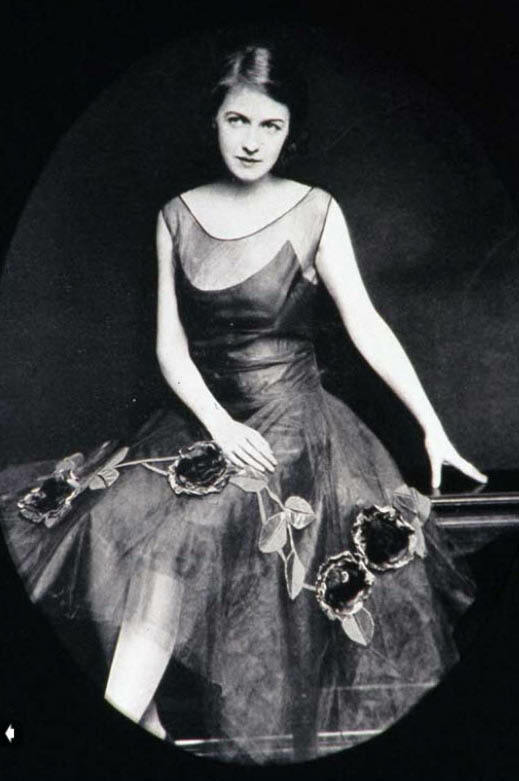 For more information on the Farnesworth estate and Wallis and Winnie Bird, read Monica Randall's article "Farnesworth and the Bizarre Saga of Winifred Bird". Thanks for the interesting presentation—I thoroughly enjoyed it. 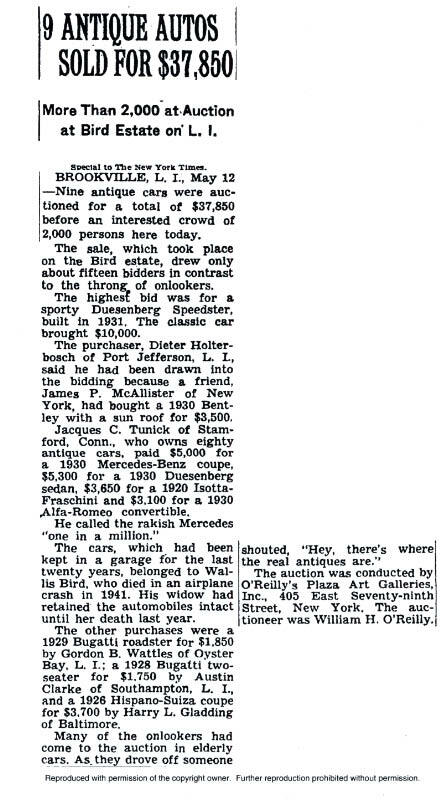 I was living in Nassau County not very far away at that time but at my young age then I hadn’t developed enough interest in historic cars to think of going to observe the auction. 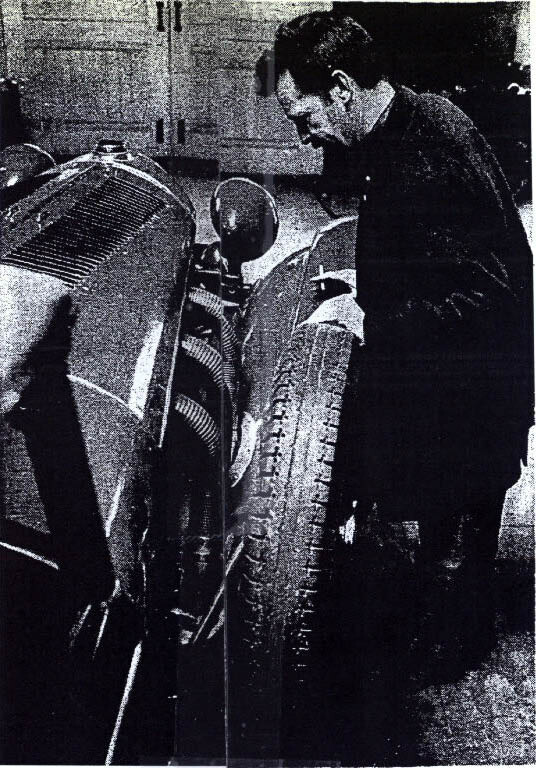 I was at this auction as well, was 12 years old, the Bugatti that Austin Clark bought had a hole cut in the top of the hood for easier access to the carburetor, and was I believe raced at Roosevelt Raceway in either 1936 or 1937 at the George Vanderbilt Cup Races held then . A lot of people who attended the auction drove over in pre WWII classic cars and I spent more time in the grassy field next to the auction taking photos of those cars (brownie box camera borrowed from my aunt) . The Duesenberg roadster (body by LeGrande) as far as I know is still owned by Dieter Holterbosch, and the Duesenberg Beverly sedan (Murphy coachwork) is owned by a collector/dealer in Va. this car when in the Bird estate had its shift lever cut off about 8 inches above the floor, and canvas covered rear top was stained as the roof of the garage leaked above it. Friends said that in the years the cars were stored there they could get into see the cars if you gave the caretaker a bottle of booze. Also in the garage was a rare 1940 Buick woody wagon with very low mileage and a 1952 Buick sedan with low miles as well. 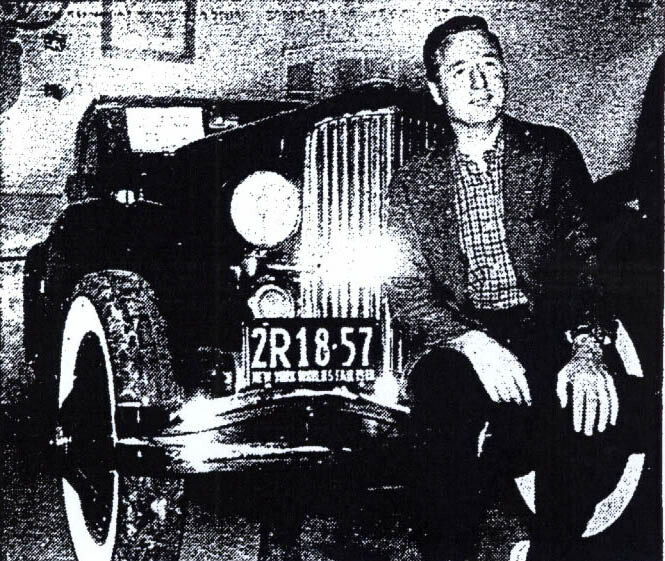 Back in the early 1970s when I worked for Austin we would go out to lunch and meet some long time Oyster Bay residents who remembered Wallace Bird and they had some pretty interesting stories about his “interests” beyond the cars. I have all this written down, plus photos (snap shots) that were found on the ruins of the mansion he had taken and were salvaged by one of the fellows we talked too back in the 1970s before the rain go to them. Photos show his boat, him and his wife, the Bugatti, plus local females who posed for him. 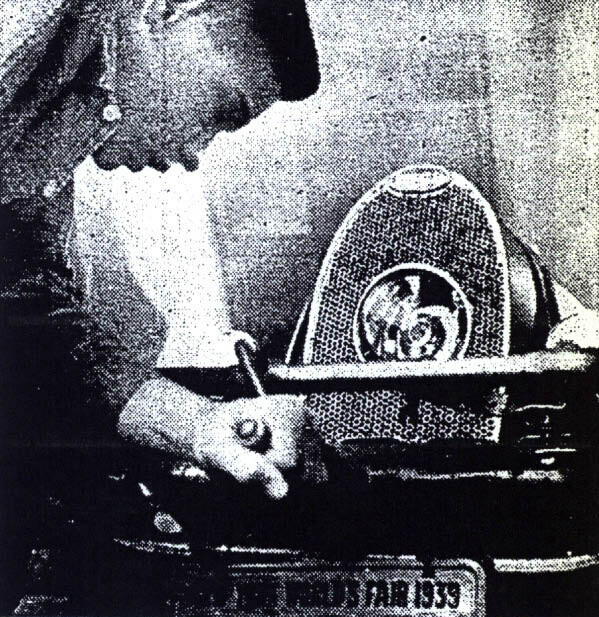 There was a good article in the August ‘62 Road & Track magazine about the Bird auction with some good photos. 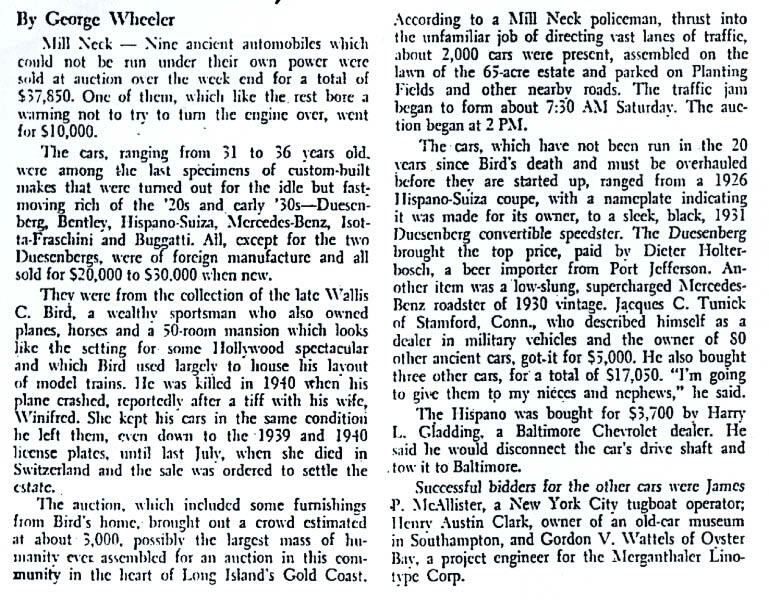 Wealthy enclaves like like location used to be good sources for early exotic car purchases. 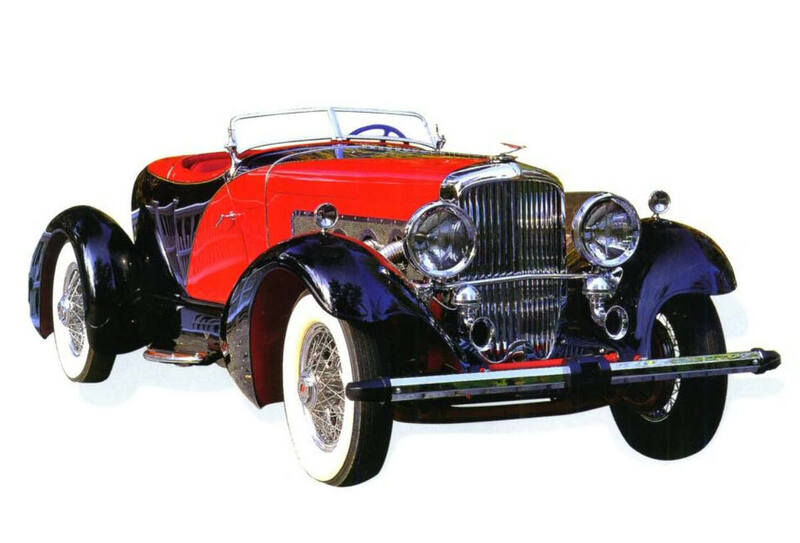 In 1943 my father bought a 1936 Mercedes 540K cabriolet that had been used in one of the “Topper” movies for $1,000. The location was La Jolla, CA., a wealthy suburb of San Diego. He later sold it in 1963 for $4,500 and was happy about it. I seem to remember this story back in the sixties. After dying in the plane crash his cars were auctioned. I recall the Buicks, I thought there were several early ‘40 Buicks included in the auction. Interesting to recall this event. My father bought the 1940 Buick woodie at the auction. It was just sitting there not auctioned and the bank sold it to him for 750.00. In 1991 I acquired it and had it until 2003 when I sold it to museum in Sarasota Florida. I was there also and 19 at the time. tried to get my father to bid on the first car up, the Murphy beverly Berlin. No luck. I bid on the type 35 bugatti. I had $1,528. not enough and again no help from dad. A great guy but too conservative.So life goes. I still have the origional sales brochure and news paper articles from that sale. It was truly an epic adventure, I retell often.